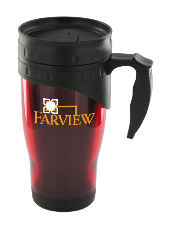 Traveler Insulated Travel Mugs with Handle. BPA Free This travel mug has a convenient comfortable handle that make it likely to be a customer's favorite logo mug. Custom printed travel mugs are part of the latest trend in promotional items. With all of the digital messages and images that are thrown at a person on a daily basis, it is nice to have a method of advertising that a person can just hold in their hands without a lot of noise and fanfare. Print your "custom logo" on these mugs and BargainMugs.com will produce a beautiful unique travel mug for a variety of uses.